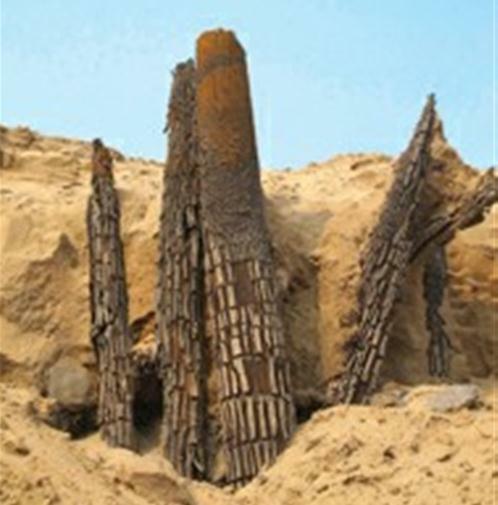 Chinese archaeologists said they believe a 2,000-year-old wooden bridge unearthed in Shaanxi province, home of the Terracotta Army, could have been the world's biggest at that time. The bridge, whose pier remnants were found in a suburb of Xi'an, capital of Shaanxi, is estimated to have been 300 meters long and 20 meters wide, said Li Yufang, a researcher at the China Academy of Social Sciences. Li said the bridge could date back to the Qin Dynasty (221-206 BC), when it spanned the Wei River, the largest tributary of the Yellow River, to link two imperial palaces in the ancient capital of Xianyang. The Qin Dynasty was the among the most powerful in early Chinese history, which saw the completion of many major projects, including the Great Wall and the Mausoleum of the first Emperor of Qin Dynasty. Its capital was near the modern-day city of Xi'an. The bridge site was first discovered in April, when sand-digging farmers reported finding huge wooden piles in their farms. An initial probe revealed the longest wooden pile to be 9 meters long, and one pier measured 18.5-meter in width. Archaeologists also found many chunks of stone that had been used to strengthen the wooden piers. "It's the first time a wooden bridge of this size and age has been found, and it is of great value to the study of ancient bridge architecture and transportation," Li said. Researchers also found a coeval, but smaller "twin bridge" about 200 meters west of the large bridge. The two bridges continued to operate in the later Han Dynasty (202 BC-220 AD), with the bigger one serving as an artery transportation line and fortress in the capital of Chang'an.